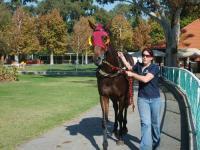 Flag Officer won his maiden race at Northam in style. He jumped first, travelled comfortably on the bit and then careered away from the opposition to win with plenty in hand. It looks as if he has a bright future as the distance of his races increases. FLAG OFFICER ON THE UP! FOR YOUR EYES ONLY is back in her favourite yard at the stables and everyone is very pleased to see her. She went to the track this morning and Troy Turner was delighted to be working her again. Democratism ran a great race, doing a lot of the bullocking work, and fought on like a tiger, almost getting back on terms with the winner. We'll be looking for another race for her in a couple of weeks. Hi everyone, Hope you're enjoying finding your way around the website. If you have any problems or queries feel free to contact either Paul or Harvey. 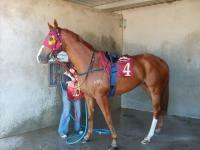 Revolition is running on Saturday in the Bolton Sprint at 3.55pm, race 7. With a good barrier and only half a kilo off the minimum this gives him a few favours over some of his rivals. GO BRUCE! We are hopeful that it's the right time this weekend.